2015 Co-Motion Supremo. Open frame–no lateral tube. All photos on this page (except for the next one) by Mitch Hull. My 2005 custom Co-Motion, based on the Speedster. Longer-than-normal stoker compartment bisected by the once-common lateral tube. The bike came with STI shifters; I moved to bar-end shifters when I installed V-brake levers. After this picture was taken, I installed 165 mm Da Vinci cranks with traditional square-taper bottom bracket spindles. Next on the to-do list: replacing the bar-ends and V-brake levers with Gevenalle integrated shifters. Mission accomplished. 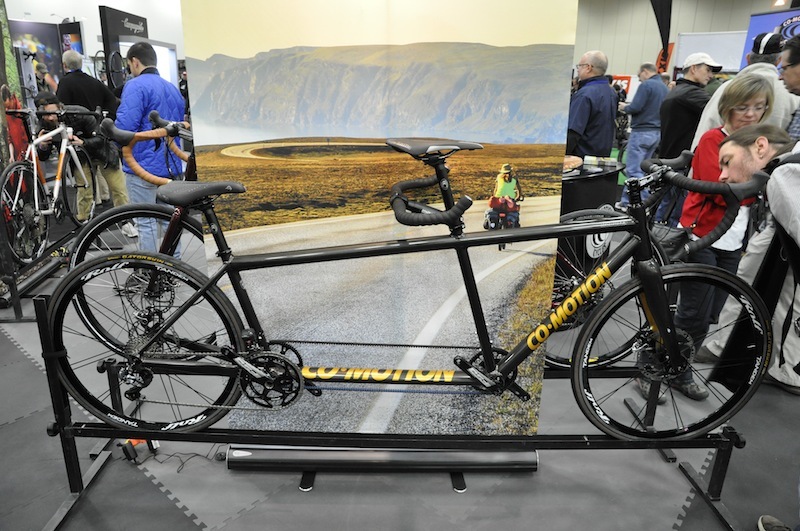 The Co-Motion team set up a display of single and tandem bicycles that was open to foot traffic on all sides, which allowed show visitors to converge on the scene from all angles. The show was also proof that my 2005 tandem, if not totally out of date, is increasingly datable. That’s because my bike, custom sized but based on the Speedster, has a lateral tube–the tube that runs from the head tube to the rear bottom bracket. 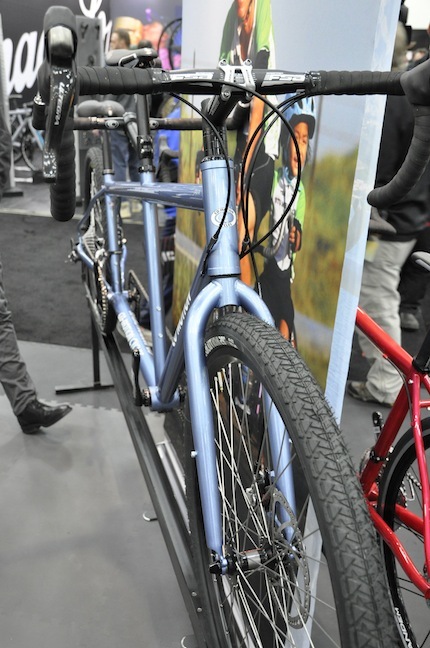 Lateral tubes on 2015 tandems? Nowhere to be seen. Deleting the lateral tube was a slow evolution for the company. It started when the super-adjustable Periscope tandem launched in 2001, 2002. That bike never had a lateral tube, probably because the stoker’s seat tube was so short. Co-Motion Java. 29 x 1.9 tires (48-622). 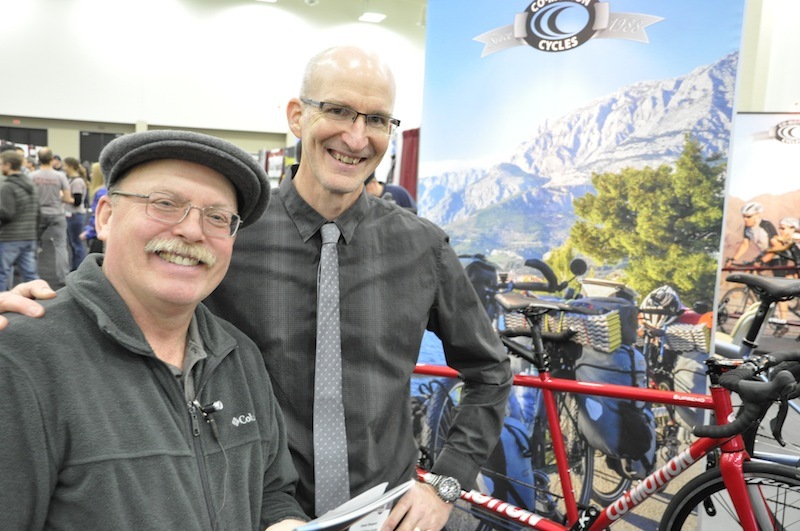 Happy customer with Co-Motion’s Dwan Shepard. Of course, Co-Motion did more than simply remove a tube. Larger-diameter tubes keep the bikes from turning into flexible flyers. The visual result, at least to my eye, is super clean. And that’s even though the decals got bigger along with the frame tubes. If nothing else, it makes it easier to know exactly what brand of bicycle is passing you at the Midwest Tandem Rally. Another benefit? If you’re thinking about a tandem with S&S frame couplers, your build takes four couplers, not six, which keeps the weight down and speeds packing and unpacking. 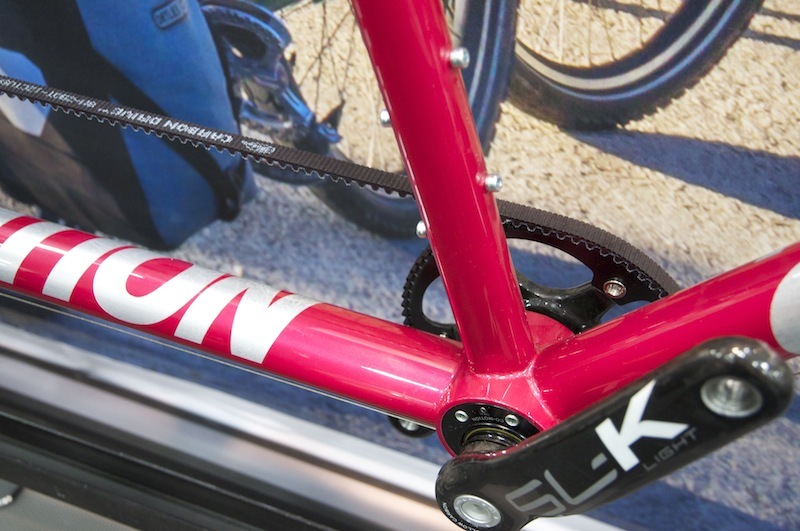 Belt drive cross over connects the front and rear cranks; big graphics connect with everyone else on the road. The stoker’s second bottle bolts on here, behind the captain’s seat tube. If there’s any downside to the no-lateral design, it’s the inaccessibility of the stoker’s second water bottle, which ends up behind the captain’s seat tube. Dwan said he felt that retaining the original position of the bottle was a poor reason to have an extra tube in the bike. If it were me, I’d bolt the cage to the stoker’s handlebars. That is, if the stoker would let me, which she absolutely would not. At least one customer had Co-Motion move the second bottle under the top tube. If you’re considering the same solution, keep in mind that you’ll need a really strong water bottle cage–or get used to stopping every once in a while to pull your bottle out of the ditch. 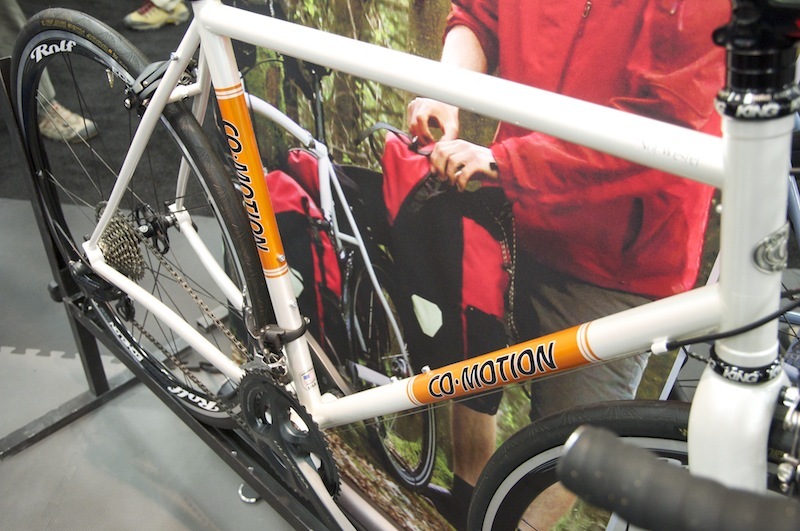 Co-Motion sells single bikes alongside its tandems. Love the clean lines and graphics of this Nor’Wester. 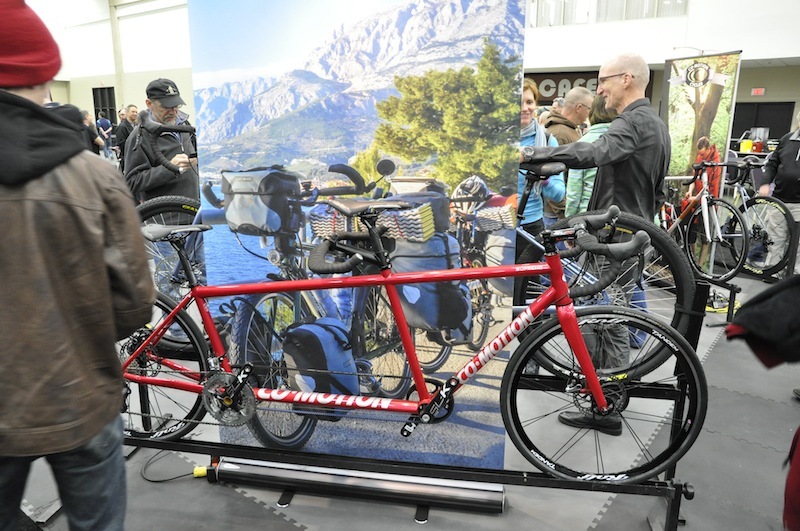 This entry was posted in Co-Motion tandem, Equipment, Report from the road and tagged Co-Motion, Handmade Bicycle Show, lateral tube, Louisville, NAHBS, North American Handmade Bicycle Show, tandem. Bookmark the permalink.